Good Morning! Pour yourself a cup of coffee and join me for today’s COFFEE DEVOTION. Philippians chapter 4 has so many great verses, that I chosen to go through this chapter a little more slowly than the previous chapters. We don’t miss anything. If you want unexplained JOY, then pay attention as we continue studying the book of JOY. Today we will only concentrate on 2 verses: Phil. 4:8-9. Yesterday we talked about what happens when we are anxious. We can only have peace in our lives when we learn how to take our problems to the Lord and leave them there. So if we are not supposed to think about thoughts that cause anxiety, what should we think about? The apostle Paul tells us in verse 8. Answer the following questions in your journal. You will want to write it down so you don’t forget this important truth. What does Paul say we should think about in verse 8? What will happen if we make this a practice in our lives (verse 9)? When you have a discouraging thought enter your mind, you don’t have to let it take up residence. Joyce Meyer says, “You don’t have to think about something just because it falls into your head.” Do you think about what you are thinking about? If your thought life is negative most of the time, then you will have a negative outlook on life. If you think depressing thoughts all the time, you will feel depressed. 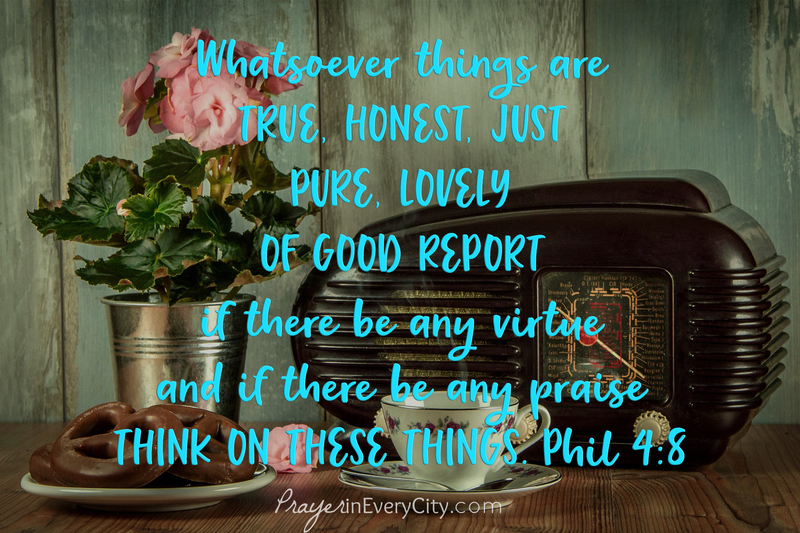 Instead, think about the things Paul recommends, then you will have peace and joy. In order to think lovely thoughts, you must fill your mind with lovely things. The best way to fill your mind with love, is to read the Bible. If you feel you have a battlefield going on inside your mind, I recommend reading Battlefield of the Mind by Joyce Meyer. You can also listen to her on YouTube. I have taught this book twice and everyone found it very helpful in them controlling their thoughts.